When I hear about a person killed while riding their bike, I think of the proverb, “there but for the grace of God go I.” I know a lot of other people have the same reaction. Even among strangers, there is a deep and difficult-to-verbalize connection to these tragedies. In some way, we’re a two wheeled tribe, more diverse than most characterizations by the media. Some people ride their bikes because they love it. Or they love the city. Or they love the earth. Or it’s just the only option they have. But in the face of a terrible crash or fatality, all of us are bound by that same bond: it could have been me. There but for the grace of God go I. When Lisa Kuivinen was struck and killed this week, we at Active Trans got the usual requests from media for comment. Who was at fault? What went wrong? What can be done? We take our responsibility as the voice of people who walk, bike, and use public transit to get around very seriously. In Chicago, we face a challenging context, where preventable death is daily news. Just last weekend, nine people lost their lives to gun violence and dozens more were wounded. In 2016, fourteen people have been struck and killed by cars while walking, but little media attention is given to these incidents. For a lot of reasons, this context can make it difficult to communicate about other preventable tragedies like bike crashes, when our TVs and smartphones are filled with so many instances of avoidable pain and harm. The public eye is focused elsewhere. But at the same time, we do feel obligated, when asked, to share the broader message that we don’t have to accept a single fatality on our roads. Every crash can be prevented. Be it by better infrastructure, better enforcement, better education, we know how to stop these deaths, and not just among people riding bikes, but among people walking and driving too. After Lisa’s crash, I had the same conversation with the same reporters as I did after Ginny Murray was struck and killed while biking only a few weeks earlier. I can’t help but weep when I think of the account told by the stranger who stayed with Lisa while waiting for emergency responders. I’m also disgusted and angered by the relentless victim blaming on social media and news website comments. 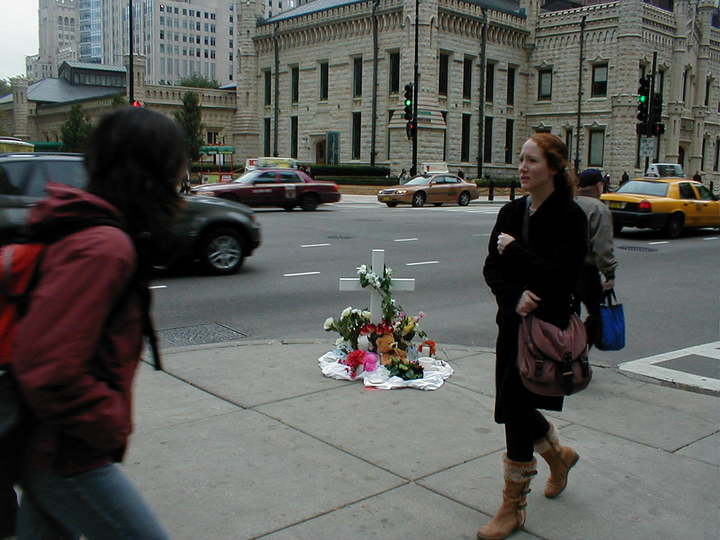 The evening after Lisa’s tragic death, I ended up walking the few miles from my house to the site of her crash at Milwaukee and Racine. I stood there for a few minutes and noticed another person across the street looking at the small memorial that has already taken shape at the corner. Just 20 years old. Who knows what may have happened had Lisa lived a full life. We need to fight back against the dehumanizing culture that has taken hold on our streets. Devaluing any life is devaluing every life. When we turn our backs on one person, we turn our backs on everyone. Protected bike lanes. Fair enforcement of traffic laws. Education for all. Vision Zero. We know how to do this. And even while we mourn and say “it could have been me,” we should not forget the progress we’ve made. It’s safer to ride a bicycle in Chicago than it has ever been before. Let’s not let anger and fear win the day. Together, here and now, we have the tools and know-how to end this. Time to get to work. This blog post was written before learning of the death of Francisco Cruz, who was struck while riding his bike in a hit-and-run crash in Chicago’s Garfield Park neighborhood. We extend our condolences to the victim’s loved ones.